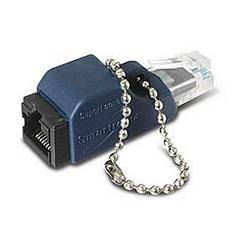 Use the simple SuperLooper together with your switch or hub to check your for breaks or shorts in network wiring. When plugged into a wall jack or onto a network cable, the loopback completes a circuit to your switch or hub. If the "connection" LED on your switch or hub lights up, you're wiring is okay.